Put two sharp-witted, incredibly talented musicians with two grand pianos on a stage, then add in a roomful of people; The result is an evening of fast, funny, and unforgettable entertainment. Their musical repertoire ranges from Classic Rock to Country, Hard Rock to R&B, and Show Tunes to Top 40. Our entertainers engage the audience making them the star of the show. It only takes a song to have the party goers shouting out requests, singing along to favorites, bantering with performers, and having the time of their lives. 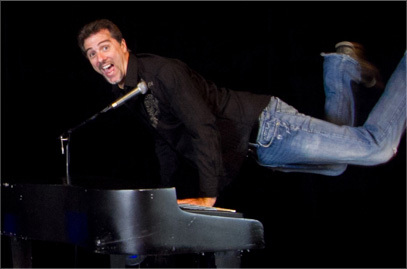 Every member of the Dueling Pianos International roster of outstanding performers is a master of fun, fast-paced musical and comedy entertainment. Our performers have been delighting audiences of all ages for nearly twenty years—and have kept them coming back for more. If you haven’t experienced a dueling pianos event yet, you need to. And if you have, we know you want to again. Two Pianos. Two Players. One Great Time.